From its humble beginnings in 1980 as a small natural foods grocery store in Austin, Texas, Whole Foods has grown to become the fourth-largest U.S.-owned grocery chain, with revenues of over $14 billion. During those 36 years, one thing has never changed: like most of its competitors, Whole Foods keeps its shelves and freezers amply stocked with the flesh and bodily secretions of animals who have been brutally exploited. 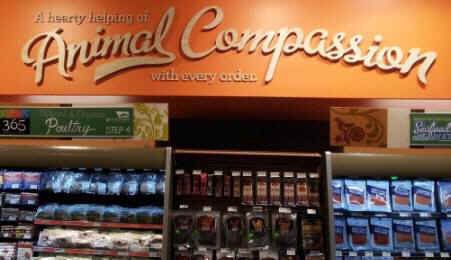 A sign above a Whole Foods meat and seafood section claiming "A hearty helping of Animal Compassion with every order." However, Americans still love “their” meat. So, paradoxically, they also tend to agree with statements to the effect that harm and exploitation are okay as long as they are done sufficiently "humanely." Polls suggest that most continue to believe that if an animal product is labeled “humanely raised,” then those animals are in fact treated humanely. Nearly 70% said they prioritize animal welfare in deciding what foods to purchase, but very few of those people are avoiding animal foods altogether. Instead, they are purchasing animal products that they have been led to believe come from humanely-treated animals. Virtually nonexistent in the 20th century, the “certified humane” label is now applied to the flesh of more than 1 billion animals annually today. 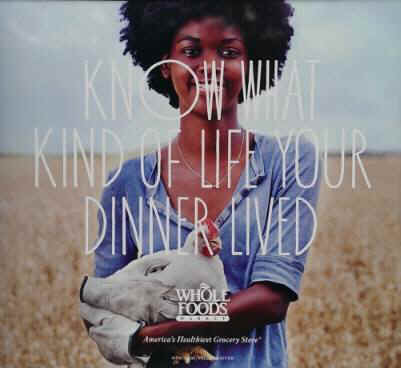 And more than any other company in the food business, Whole Foods has attempted to market itself as compassionate toward animals, beginning in the early 2000s with its Animal Compassionate label (and associated Global Animal Partnership certification organization) and continuing with a $20 million “Values Matter” national marketing campaign in 2014. Inside every Whole Foods, you will see signs like this one designed to convince you that Whole Foods cares about the animals whose flesh and bodily secretions it sells and makes sure they are treated humanely. Whole Foods says its animals are “responsibly raised” on farms where they largely roam free and have the opportunity to engage in natural behaviors, stating that “We are committed to and focus on animal welfare for all species of animals raised for our meat department.” It even offered, at a store in Maine, to “humanely” electrocute lobsters there at the store for customers who were squeamish about boiling them alive at home. An ad from Whole Foods' "Values Matter" campaign. Here, a human is holding a chicken lovingly with the strange caption "Know what type of live your dinner lived." Whole Foods profits massively from making claims of humane treatment, charging as much as five times the average price for turkey, for instance. But even if everything Whole Foods said about treatment of animals on its highest-rated farms were true, the “humane” claim rings hollow when we realize that we would never allow anyone to kill our pet dogs or cats at a tiny fraction of their natural lifespan. And a closer look at Whole Foods’ standards reveals that they allow for pigs and calves to be castrated without anesthesia, for sows to be nose-ringed, for turkeys to be “euthanized” by having their necks broken bare-handed, for male chicks to be killed at birth because they cannot lay eggs, and for calves to be separated from their mothers so that humans can have their milk. Unfortunately, many animal protection organizations collaborated in promoting the myth that animals were being treated humanely on farms like the ones that supply Whole Foods. PETA gave Whole Foods an award for being the “best animal-friendly retailer.” Veg News magazine honored Whole Foods CEO John Mackey with its 2005 “Corporate Executive of the Year” award. Most infamously, in 2005 philosopher Peter Singer wrote an open letter to Mackey, co-signed by a virtual who’s who of prominent animal advocacy organizations at the time, expressing “appreciation and support” for Whole Foods’ “pioneering initiative” in creating its farm animal compassion standards. A lot of water has passed under the bridge since then. Critics, most prominently Gary Francione, pointed out that this letter gave a “green light” to consumers, even those who cared deeply about animals, to continue purchasing animal products from Whole Foods based on the false idea that the animals had a good life. Writer and activist James McWilliams called on Whole Foods to stop selling meat altogether. Increasingly, the growing abolitionist wing of the animal advocacy movement has questioned the claim that advocating or expressing support for minor reforms in animal welfare is a meaningful stepping stone toward abolishing animal exploitation altogether. And as Whole Foods’ efforts to market itself as a compassionate corporation have increased, the spotlight has been shone ever more brightly on its practices. It has been investigated and found guilty of price gouging, and is so notorious for its high prices that many call it “Whole Paycheck.” It was also found to have employed prison labor to produce some of its cheese and fish, at a pay rate of 60 cents an hour. Moreover, despite its lofty claims about its commitment to animal welfare, Whole Foods has become a case study in why we should not believe food corporations’ humane-washing hype. One investigation of a Whole Foods supplier revealed young rabbits deprived of water in filthy cages before being slaughtered for meat, with as many as 30 a day found dead before they could even be sent to slaughter. Another found widespread disease and suffering and crowded, filthy conditions at a “Certified Humane” cage-free egg supplier. Last year, investigators from PETA—yes, the same PETA that 11 years ago signed on to Singer’s effusive praise of Whole Foods for its concern for animal welfare—found pigs crammed into crowded sheds on concrete floors at a Whole Foods supplier. 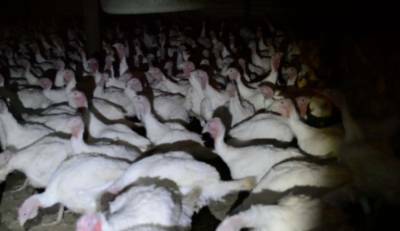 Most recently, our own investigation of one of Whole Foods’ highest-rated turkey suppliers, Diestel Ranch, showed that contrary to Whole Foods’ claims that its turkeys live free on open pastures, they were instead crammed into dark, disease-filled sheds. Countless birds suffered and died, often afflicted with swollen crops the size of grapefruits, completely unable to walk, or suffocating on ammonia-filled air in extremely crowded conditions. We have been “accused” by Diestel Ranch of wanting to “end farm agriculture and meat consumption completely.” We stand guilty as charged. With these now well-documented facts about the actual living conditions of animals marketed by Whole Foods as “humanely raised,” and in light of the fact that there is no such thing as humanely exploiting or killing animals, today we are releasing a new open letter to Whole Foods CEO John Mackey. Co-signed by 25 other animal advocacy organizations, including three of the signatories of Peter Singer’s original letter, this letter calls upon Whole Foods to end its fraudulent marketing of animal agriculture as “humane” and to stop supporting animal agriculture altogether. Of course, Whole Foods is only the tip of the iceberg as far as animal exploitation is concerned. Tens of billions of animals are killed every year for food and tens of millions more for things like clothing and research. Virtually all of them are leading short and miserable lives. As DxE co-founder Wayne Hsiung said of Diestel Farms, “This farm was the best of the best — literally in the top 0.1%. So if this farm is cruel, what does that say about the rest of the industry?” Animals are not ours to use, and a society that treats them as property dooms them to a life of cruelty and, typically, an early death. Every animal deserves to be happy and free, and we will keep fighting animal exploitation until that comes to pass. Jeff Melton is a social psychologist, longtime vegan, and human and animal rights activist. He has organized with DxE since 2013.